George Graham reviews Eileen Ivers' "Beyond the Bog Road"
Irish and Celtic music has come a long way since it was considered ethnic folk music and far from the popular mainstream. But starting with the Chieftains in the 1970s, the style has been finding wider audiences, especially in the wake of more popular theatrical treatments like the Riverdance performances and groups like Celtic Thunder, who have been finding significant audiences with their Public TV specials. Not surprisingly, a lot of creative artists have been applying their abilities in the cause of taking the music to new places. The band Solas is a good example of that. One of the more creative and eclectic artists who have been drawing on the Celtic tradition is fiddler Eileen Ivers, who had just released her new album Beyond the Bog Road. Eileen Ivers grew up in the Bronx, New York, the daughter of Irish immigrants. She played fiddle from and early age and won nine All-Ireland fiddle championships, plus one on banjo. She made frequent trips to Ireland with her parents while growing up. However, her academic major was mathematics and she intended that as a career. She was doing post-grad work when the call of the fiddle began to overtake her interest in math. Since then, she has been involved with a wide variety of projects, including being a founding member of the group Cherish the Ladies, and was also on the Riverdance tour. She has been releasing a somewhat infrequent series of albums, ranging from traditional to very eclectic. Her 2003 album called Eileen Ivers and Immigrant Soul, was in my view, a classic, incorporating the styles that she heard in the ethnically diverse area where she lived, including salsa, rock, funk and the Irish influence. While she did a Christmas album in 2007, the new release, Beyond the Bog Road, is her first full studio album under her own same since Immigrant Soul. The new album is also rather wide-ranging, but the record is made like an old-fashioned folk album, with detailed annotations on the origins of the songs. Her notes cast light on the past interactions between the Irish and other ethnic groups that include fiddles in their styles, from Acadian Canadians who became the Cajuns, bluegrass musicians who draw of Appalachian folk, a lot of which derives from the music of the Celtic lands, and even something from jazz from the 1920s. The result is a recording that is not quite as wildly eclectic as Immigrant Soul, but still has a lot of interesting stylistic juxtapositions. The title of the album Beyond the Bog Road is a reference to the numerous little roads in Ireland through the bogs that carried so many of the Irish on their way to the New World. There are some vocals, but also a fair number of instrumental pieces that tell their stories of the ethnic meetings that took place in America. The album features a variable cast who are recruited for the various tunes, and include among others country and bluegrass singer Tim Shelton, Irish vocalist Niamh Parsons, blues harmonica player and singer Tommy McDonnell, who appeared prominently on the Immigrant Soul album, Joanie Madden from Cherish the Ladies, and various others from both sides of the Atlantic. The material includes both traditional and original music, along with creative original arrangements of traditional music. As mentioned, the CD booklet is generously annotated with explanations on the origins of the tunes, with an emphasis on the Irish migration, which saw the diaspora turn up in places as diverse as New Orleans and the Canadian Maritimes. Perhaps the most distinctive and unexpected track is Irish Black Bottom. Ms. Ivers points to a little-known connection between African American tap-dancing and the familiar Irish dance style, which she says was inspired by tap dancing. There were an Irish-American dancer and an African American tap-dancer who often performed together or in contests against each. The Black Bottom was a popular dance craze of the 1920s, and Ms. Ivers pointed out the connection through this piece, Irish Black Bottom, which was written by Louis Armstrong. 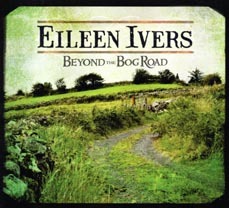 Eileen Ivers' new album Beyond the Bog Road is another enjoyable and skilfully eclectic recording by one of the most creative of the Celtic fusion artists. She again mixes influences, but this time does it with a strong historical perspective through her research on how the Irish diaspora spread beyond the expected places and interacted with other cultures. With all of that going on, it's almost easy to overlook Ms. Ivers' excellent fiddle playing. She surrounds herself with some fine players whose diverse backgrounds serve to illustrate the musical diversity. The combination of traditional music and some originals provides a good balance. Our grade for sound quality is about an A-minus. The mix is clean and has everything in the right place without sonic gimmicks. We'll deduct the usual points for the loudness being cranked up through volume compression that degrades the dynamics of the performance. It has been thirteen years since Ms. Ivers' memorable album Immigrant Soul. Hew new recording Beyond the Bog Road is another highlight of an illustrious career.